Pimpex Plastic, China supplies drinking straw machinery set such as small sizes tubular pipe product extrusion line, full automatic flexible straw forming machine, U shape flexible straws packing machine, etc. Pricing at USD53,183/LINE EX-WORK factory including 1 set extruder, 3 sets forming machines, 1 set packing machine to produce above shown dual colors U shape drinking straws at around 600~700pcs/minute output capacity. Lead Time: around 35 days after Seller's receipt of down payment. Quality Guaranteed Period: One year if Buyer correctly operates equipments and keep necessary maintenances. Of course, those wearing parts are not listed in guaranteed list. The manufacturer presents plastics formulation and all necessary process parameters to Buyer. The manufacturer offers long term technical supports and spare parts at costs level. It is composed of dual colors extruder and die, vacuum calibration and cooling unit, haul-off and rotary cutter or coiler, all the machine's controls adopt ergonomical elements for easy operation. One operator is sufficient to run the line. This tubing extruion line is suitable for food industry such as drinking straws, ice cream bars, popsicles, lollipops, stick candies and others small sizes profile shapes like cartridges, penholders, spray nozzles pipettes, cotton swabs bars, medical tubes, various toy pipes, cable pipes, catheters, automobile brake tubular, etc. Incision Type: 90/90, 90/45, 90/60, 45/45, 60/60. Remarks: Such extruder could be updated for plastics straws with multicolors, triple colors or single color with spiral stripes or straight stripes. Automatic Preset Batch Quantity Alarm, Convenient for workers' packing into bags. This full automatic flexible straw forming machine is an equipment which could make out flexible straws, it is full automatic running from straight pipes input to finished straws output, it needs only a operator to feed in straight pipes raw materials. Polypropene PP straight pipes supplied into the batch hopper at the top of machine would be feeded one by one into the main rotary drum of the machine and clamped by two mechanical clinchers. The main rotary drum's rotation will make straight pipes pass through two rotary press dies to gain die-impressed effect, then the die-impressed pipes would be compressed by two mechanical clinchers to make straight pipes' impress looks like folded & constricted coils, thus finished flexible straws would be automatically conveyed out. 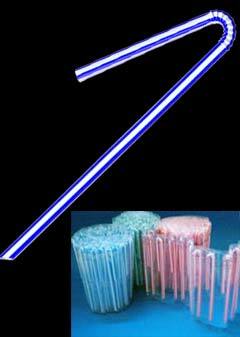 the main rotary drum usually could carries 12 straws continuously to gain high output capacity of flexible straws. This full automatic U shape flexible straws packing machine is an equipment which could bend flexible drinking straws into U shape and then automatically pack them into bags. 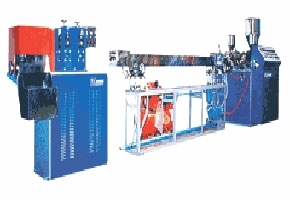 The complete machine is constructured with driving motor, thin film rolling device (2 groups), transmission system, unloading device, straws filling device, sealing device, substandard straws restoring device, etc. 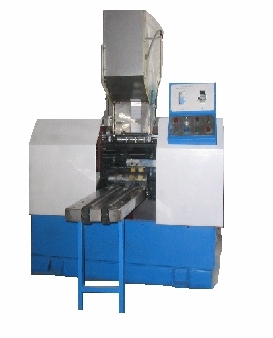 It is an ideal machine with reliable & stable quality, easy operations. It is mainly used as auxiliary equipment for sterile packaged drinks.